(C) 2011 VILLAGE ROADSHOW FILMS (BVI) LIMITED. All Rights Reserved. In 1891, Irene Adler (Rachel McAdams) delivers a package to Dr. Hoffmanstahl (Wolf Kahler) - payment for a letter he was to deliver. Hoffmanstahl opens the package, triggering a hidden bomb which is prevented from detonating by the intervention of Sherlock Holmes (Robert Downey, Jr.). Holmes takes the letter and disposes of the bomb while Adler and Hoffmanstahl escape. Holmes later finds Hoffmanstahl assassinated. Adler meets with Professor Moriarty (Jared Harris) to explain the events, but Moriarty poisons her - deeming her position compromised by her love for Holmes. Some time later, Dr. Watson (Jude Law) arrives at 221B Baker Street, where Holmes discloses that he is investigating a series of seemingly unrelated murders, terrorist attacks, and business acquisitions, that he has connected to Moriarty. Holmes meets with the Gypsy fortune-teller Simza (Noomi Rapace), the intended recipient of the letter he had taken from Adler, sent by her brother Rene (Laurence Possa). Holmes defeats an assassin sent to kill Simza, but she flees before Holmes can interrogate her. After Mary (Kelly Reilly) and Watson's wedding, Holmes meets Moriarty for the first time. Moriarty informs Holmes that he murdered Adler and will kill Watson and Mary if Holmes' interference continues. Moriarty's men attack Watson and Mary on a train (Conductors: Mike Grady, Anthony Inglis) to their honeymoon. Holmes, having followed the pair for protection, throws Mary from the train into a river below where she is picked up by Holmes' waiting brother Mycroft (Stephen Fry). 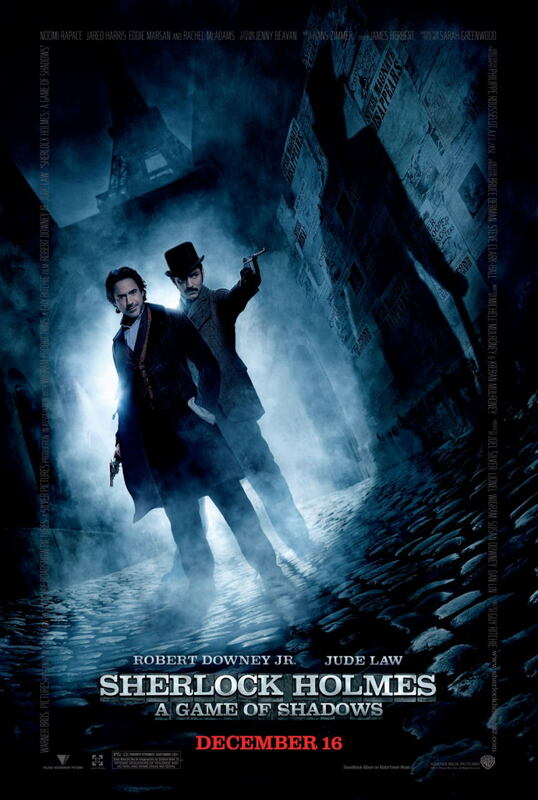 After defeating Moriarty's men, Holmes and Watson travel to Paris to locate Simza. When she is found, Holmes tells Simza that she has been targeted because Rene is working for Moriarty, and may have told her about his plans. Simza takes the pair to the headquarters of an anarchist group to which she and Rene had formerly belonged. They learn that the anarchists have been forced to plant bombs for Moriarty. The trio follows Holmes's deduction that the bomb is in the Paris Opera. However, Holmes realizes too late that he has been tricked and that the bomb is in a nearby hotel; the bomb kills a number of assembled businessmen (Richard Cunningham). Holmes discovers that the bomb was a cover for the assassination of Meinhart (Thorston Manderlay) - one of the attendees - by Moriarty's aide, Sebastian Moran (Paul Anderson). Meinhart's death grants Moriarty ownership of Meinhart's weapons factory in Germany (German Officers: Peter Stark, Roman Jankovic). Holmes, Watson, and Simza travel there, following clues in Rene's letters. At the factory, Moriarty captures and tortures Holmes, while Watson is under sniper fire from Moran. Moriarty reveals that he owns shares in multiple war-profiting companies, and intends to instigate a world war to make himself a fortune. Meanwhile, Watson uses the cannon he had been hiding behind to destroy the lighthouse in which Moran is concealed. The structure collapses into the warehouse where Moriarty is holding Holmes captive. Watson, Simza, and an injured Holmes reunite and escape aboard a moving train. Holmes deduces that Moriarty's final target will be a peace summit in Switzerland, creating an international incident. At the summit (Diplomats: Jonathan Christie, James McNeill, Ray Donn, Jeff Lipman), Holmes reveals that Rene is the assassin and that he is disguised as one of the ambassadors - having been given radical reconstructive surgery by Hoffmanstahl to alter his appearance. Holmes and Moriarty, who is also in attendance, retreat outside to discuss their competing plans. Watson and Simza find Rene and stop his assassination attempt, but Rene is himself silenced by Moran. Outside, Holmes reveals that he previously replaced Moriarty's personal diary that contained all his plans and financing with a duplicate. The original was sent to Mary in London, who decrypted the code and cypher using the the information on the board and a book that Holmes had noticed in Moriarty's office during their first meeting. Mary passes the information to Inspector Lestrade (Eddie Marsan) who seizes the bulk of Moriarty's assets, financially crippling him. Holmes and Moriarty anticipate an impending physical confrontation, and both realize Moriarty would win due to Holmes' injured shoulder. Holmes instead grapples Moriarty and forces them both over the balcony and into the Reichenbach waterfall below. Their bodies are not found. Following Holmes' funeral, Watson and Mary prepare to have their belated honeymoon when Watson, who is now writing the last few lines from "The Final Problem", receives a package containing a breathing device of Mycroft's that Holmes had noticed before the summit. Realizing that Holmes is still alive, Watson leaves his office to find the delivery man. Holmes, having concealed himself in Watson's office, reads a fresh eulogy on Watson's typewriter and adds a question mark after the words "The End".